It would be more accurate to say « About me » because the editions SIVILIXI amount to one and the same person, at the same time publisher, salesman, accountant, author and store man, in brief, your servant : Patrick Coq. Fascinated by the so called historic tarots for more than 25 years, I began logically with the study of the tarot of Marseille, editions Grimaud because it was the most well know and – I did not know it at the time – because it contains a part of the inheritance of the old tarots. Then I discovered the edition of the tarot of Viéville of the publishing house Héron-Boechat. I felt that with the Viéville there was a possibility of really understand these strange and fascinating images. So, for more than 30 years I have been interested by the occult and official sciences, with always in the background the idea of finding elements there which would allow me to understand this mysterious tarot. A few years ago I finished the first part of my study of the tarot of Viéville and I then started to try and find a publisher. I was already aware that a study concerning only one single tarot would put off even the most adventurous of publishers, but then I discovered that the only edition of the tarot of Viéville was exhausted and would not be republished! This discovery plunged me into a commercial dilemma: what interest could it have for a publisher to invest in the publication of a study based on a tarot, knowing that this tarot would no longer be available ? Added to this, my essay deciphering an esoteric tarot of the XVIIth century was a little against the current « market trends ». Instead of offering an express method of valid divination for all the tarots, it proposed to provide elements of understanding with which the reader could form his own opinion on the meaning of the mysteries of the tarot Viéville , which was not the most well known, far from it. However it seemed to me to be the most significant. In brief, it seemed like a lost cause. I only had two options: put my manuscript away on a shelf of my bookcase or re edit the tarot of Jacques Viéville, and publish at my own expense my study » The Mysteries of the tarot of Viéville « . I chose the second option. I wanted to share with tarot enthusiasts and curious readers a beautiful reproduction of the tarot cards , in the correct format, and also to make accessible my study which, I believe it, is of interest. Of course, I have to confess I also wanted to avoid my own regrets in having to throw in the towel ! So I have become a publisher. It is a big word for what in reality is a very small publishing house but is nevertheless an enormous expense of energy for a dilettante. So now the introductions have been made. 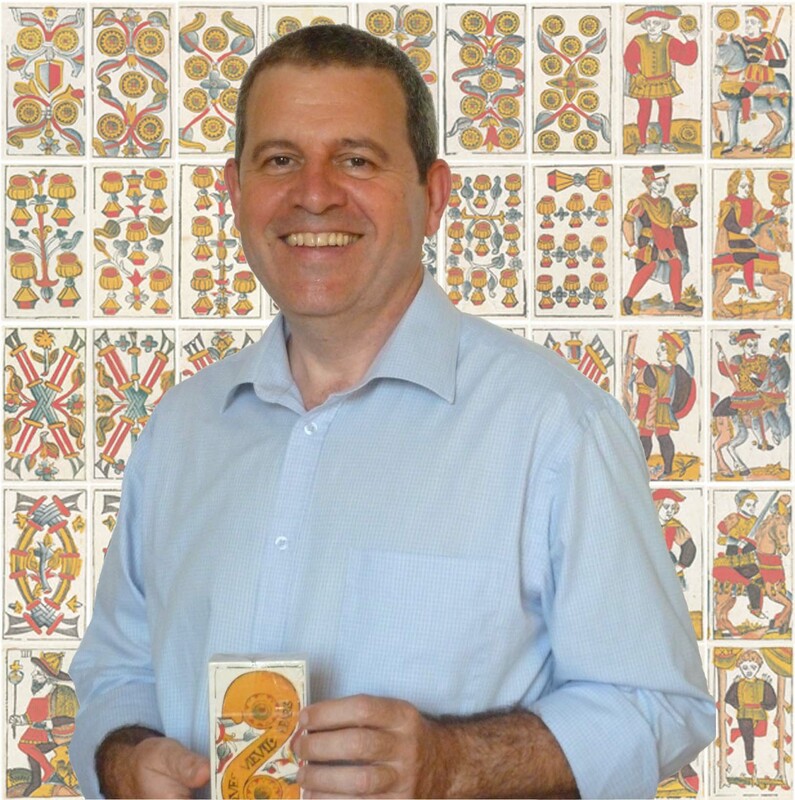 If, dear visitor, this small firm is successful and I am still pursuing my research, why not continue with the republication of other magnificent old tarots, such as the tarot Dodal which deserves to be available , or the tarot Noblet which is virtually unknown today. Because, as I hope you will have understood , the master rule of this small publishing house is – as far as possible knowing that we always strive to do our best – the absolute respect of the original so that we can immortalize in the greatest detail these strange images, the Rota, the small World as the reflection of the big World. Enough Philosophy, I will let you discover this site (and particularly the shop to place your order!!). I invite you to return from time to time because I hope to expand it regularly by the addition of new pages and, hopefully, new publications. PS: please do not hesitate to send me your remarks and suggestions in the section contact.